Panama Canal first gate for Pacific side gets transited. 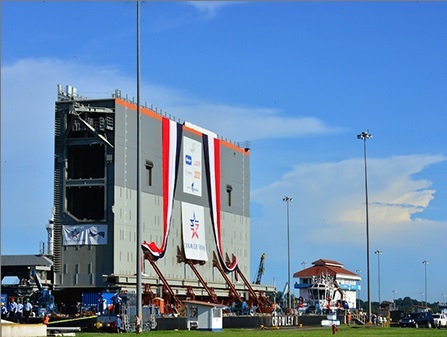 Leave a Comment on Panama Canal first gate for Pacific side gets transited. The first gate for the new locks in the Pacific side began transit through the Panama Canal, signaling another historic milestone in the progress of the Expansion Program. The gate transits the waterway aboard the Crowley 455-4 barge from the Atlantic temporary dock to the Pacific, assisted by two Panama Canal tugs. It completed its transit through Gatun Locks in the Atlantic this morning. The gate will continue its transit throughout the day, arriving at Pedro Miguel and Miraflores Locks later this afternoon. It will then be transferred to the construction site of the new locks in the Pacific. The first gate to be transferred to the Pacific side is the smallest, standing 22 meters tall and weighing 2,300 tons. The height of each gate depends on its position inside the lock chambers. The tallest ones (33 meters high) will be located in lock head four facing the Pacific Ocean due to the tidal change in the area. The height of the tallest gate can be compared to an 11-story building. The gates weigh on average 3,400 tons. Since August 2013, the gates have been arriving in staggered shipments from Italy on a Post-Panamax vessel to a temporary dock in the Atlantic side. The first shipment arrived on August 20, 2013. The second and third shipment arrived on June 10, 2014 and September 7, 2014, respectively. The last shipment has already departed from Italy and is expected to arrive in November 2014. The new locks will have 16 rolling gates, eight in the Pacific and eight in the Atlantic. The gates were fabricated in Italy by Cimolai SpA. During the next two months, the remaining seven gates that belong to the new locks in the Pacific will be transiting one by one through the Panama Canal. The Panama Canal Expansion is 80 percent complete. It consists on the construction of a third lane of traffic allowing the passage of bigger vessels, which will double the Canal’s capacity and have an important impact on world maritime trade.